This is a Super City Elevated Rails Model Train Set HO Scale from Life-Like Trains. Retail $289.99 SAVE 24% ! "One of the best deals you can find!" I highly recommend this product because this set really does include all you need to make your own miniature city! Well done, Life-Like and HobbyInc! Twice the fun in one complete set! 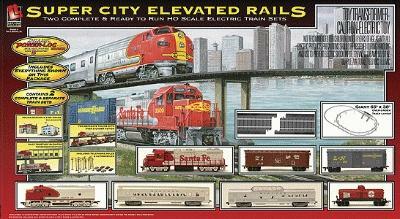 With both freight and passenger trains running on two levels, this set is packed with big-time railroading action. The freight train includes a GP38-2 diesel with working light, Wooden Box Car, Tank Car and Sliding Door Box Car, while the passenger train features a powered F7 diesel with headlight pulling a Coach and Observation cars, which also have interior lights. The action takes place on two complete loops of track: a 65 x 38" (1.6 x 0.9m) oval for the lower, plus a 47 x 38" (1.1 x 0.9m) oval with snap-in elevation piers for the upper level. Each level also has it's own UL-listed power pack for independent control. For more big city fun, the set comes with a snap-together railroad station, plus Fire House and Police Station building kits, 24 signs, telephone poles, automobiles, street lights and much, much more.